Concentric Pumps Limited has completed the installation of "low lubricity" testing facilities at the group's development and technology centre in Birmingham UK. The new facility gives Concentric the ability to conduct accelerated testing to study the demands placed on diesel engine fuel systems by the advent of unit injector and common rail technology. In addition to studying the implications of increased flow and pressure control requirements, the facility will also model other conditions, such as dry prime, cooling, stalled flow and the effects of dirty or low-lubricity fuels on fuel transfer pumps. Poor quality fuels are common not only in less developed parts of the world but also in first world applications where low grade or non-pump fuels are used. They can cause premature component wear and failure in various parts of the fuel system, since the pumped medium is normally used to lubricate the pump. In recent years, these damaging effects have been exacerbated by the escalating performance requirements of the new engine technologies. This latest addition to Concentric's comprehensive test facilities centres on a dual-station, back-to-back durability rig which runs at high temperatures for purposes of accelerated testing. Heat further reduces the viscosity of the pumped medium and therefore its efficiency as a lubricant. As a result, good, iterative product evaluation can be achieved by a few hundred running hours in the test rig rather than several thousand on the road. The fluids used for test purposes are diesel, kerosene, aviation jet fuels and a few kerosene-based calibration fluids. In order to obtain the desired levels of lubricity, the fluids have to run at temperatures up to 100?C and pressures up to 20 bar- in all cases above their flashpoint. Consequently, the installation has been specially designed and designated Zone 1 under BSEN60079-10 with a Zone 2 surrounding area and automatic fire detection and extinguishing systems. David Woolley, Managing Director of Concentric Pumps, commented: "This is the latest in a series of significant investments at our Birmingham plant and demonstrates our commitment to maintaining and reinforcing our leadership in pump technology for diesel engines. 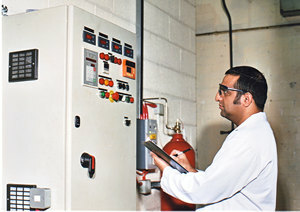 One of the most important aspects of the project and the investment is the very high standard of Health and Safety precautions associated with running fuel tests at elevated temperatures. However, the benefits are wide-ranging and the facility's accelerated testing capability is already an integral part of the validation process in all new Concentric fuel pump designs." Concentric Pumps Limited is a subsidiary of Concentric plc, a major supplier to the world's, truck, agricultural and construction equipment industries with plants in the UK, USA and India. In addition to oil, fuel transfer and water pumps for diesel engines, the group also manufactures lubrication pumps for transmissions and compressors.